We are excited for Jonathan Stout and his Rugcutters featuring Hilary Alexander , an update to the “Campus 5 +2” band the repertoire can now take advantage of the compositional advantage that having 4 horns provides. The “octet” format can function as normal small-group swing band, but can also functional more like a small big band, with independent reed and brass sections. The group was started in 2015 by Los Angeles based jazz drummer – Josh Collazo. 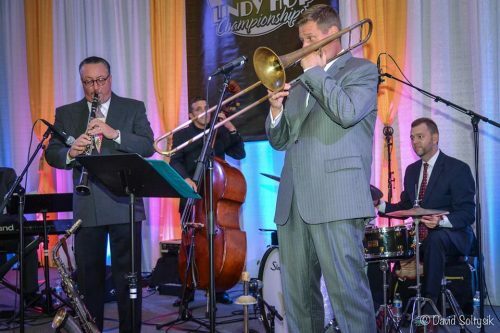 Josh has been playing in traditional jazz and swing bands since he was 18 years old. Over the last 18 years, he has performed with countless bands which include Edward Sharpe & the Magnetic Zeros, Jonathan Stout & his Campus Five feat. Hilary Alexander, the Carl Sonny Leyland Trio, Dave Stuckey & the Hot House Gang, and the Lindy Focus All-Star Orchestra led by Jonathan Stout. Eventually a chord struck inside him to begin composing original “classic” jazz and swing music in the style that he holds dearest in his heart. He enlisted long-time musical companion, saxophonist, & co-arranger – Albert Alva – to begin wading through the pile of songs that had been stacking up. Over the course of a few months, Albert and Josh created the arrangements that would go on to be recorded for the groups first album. Finding the right musicians for the new band was not difficult at all since Los Angeles has a thriving “vintage” jazz scene. Their sound is characterized by an aggressive four-on-the-floor time-feel, thick & riffy horn arrangements, and an eclectic songbook that touches on the sweet and sentimental as well as the hot and bothered. The band plays in various configurations, and each version of the group explores different avenues of the classic repertoire. Bandleader Michael Gamble’s 15+ years of work in every aspect of the global swing dance community informs the band’s repertoire and taste. The music will carry a dance floor all night long, but is just as comfortable in listening rooms, or even setting a classy tone for a private event. Michael Gamble and his Rhythm Serenaders pursue one mission in any setting: to share the joy and infectious energy of mid-20th century American Jazz! 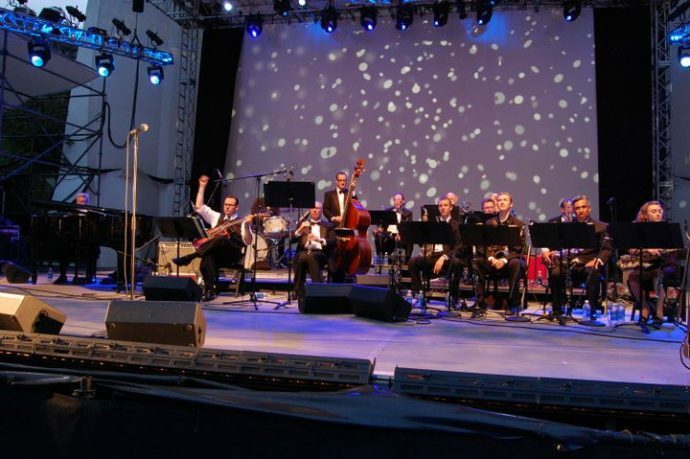 Jonathan Stout Orchestra is the nation’s premier swing dance big band. Like an upsized version of the Campus Five, the Orchestra showcases the big band sound of the late 1930’s and early 1940’s, and is the most danceable big band anywhere. The 15-piece Orchestra captures the unmatched excitement and true rhythmic pulse of the Swing-era. The band follows the templates of Benny Goodman and Count Basie – orchestras that are aggressive and tight, and filled with all-star soloists that bring the fire on every song, regardless of tempo. The Orchestra was founded because promoters demanded a full big band that was as danceable and exciting as the Campus Five. Jonathan and Hilary responded with a big band that was designed to be the ultimate swing dance orchestra. Like the Campus Five, the Orchestra has the true the sound and feel of the Swing-era, because that is what makes real Swing music so danceable in the first place. With their unique brand of musical Americana and hot jazz revelry, the Boilermaker Jazz Band brings the party to you! The Band interprets the great American song book in their own unique fashion, bringing the swinging sounds of the jazz age back to life. You’ll hear familiar classics and rarities performed by superb instrumentalists and heartfelt vocalists. From concert halls to dances, festival stages to elegant soirees, listeners and dancers agree — with their infectious beat and enthusiasm this band can make any crowd move!